Tempeh Shepherd’s Pie is a perfect winter warmer. During the colder months I like to make up a big casserole dish and eat it all day long. There is a perfect balance between the three scrumptious layers – savory mushrooms, creamy mashed potatoes and rugged tempeh with pecans. Cut frozen or thawed tempeh into large cubes. In a sauté pan bring water and tamari to a boil. Place the tempeh in the pan, lower heat, and simmer uncovered for 20 minutes. If the liquid evaporates, add a little more water to the pan. While the tempeh is simmering, sauté the onions in the oil with the thyme, coriander, and black pepper until the onions are translucent. Stir in the chopped pecans. Add the tempeh and lemon juice. Remove from heat. 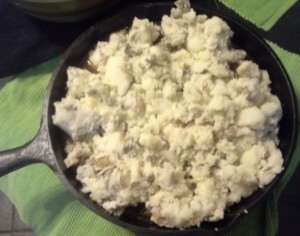 Crumble or mash the tempeh into the pan (a wire whisk works well for mashing). Place the cubed potatoes in a saucepan and cover with lightly salted water. Bring to a boil, and then simmer the potatoes until soft. Drain, saving the hot potato water to use in the gravy. Mash the potatoes with the butter substitute and milk. Salt & Pepper to taste. Sauté the mushrooms, soy sauce, and black pepper in oil, stirring occasionally, until the mushrooms are tender. Add 1 1/2 cups of the potato water and bring to a boil. Slowly stir in the cornstarch mixture and cook at a low boil, continuing to stir, until the gravy is clear and thick. Now you are ready to assemble your tempeh shepherd’s pie! Oil a 9 inch square casserole dish. 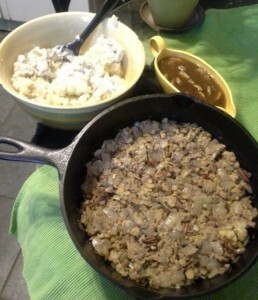 Layer the tempeh mixture, then the mushroom gravy, and then the mashed potatoes. Dot the top with butter substitute and sprinkle with a touch of salt & pepper. Bake at 400° for 15-20 minutes until the top becomes golden.